I found this idea on Pinterest and love how it draws a connection between Jesus and the candy/goodies that have come to represent Easter to so many. I want my kids to have a fun Easter and be able to indulge in treats and little gifts like other kids, but not at the expense of our faith and beliefs. It’s often hard to keep the true message of Easter alive amidst the commercialized flare of the season. This jar is the perfect addition to those family traditions you already hold sacred. Originally, I thought I would make jars for both of my kids and put them in their baskets, but then I thought it would make more sense to have a family jar that we could bring out each year. I love the idea of having a physical symbol to remind us that we have a role in Easter as well. It helps the kids to understand and remember that Easter can be about giving as well as receiving. I made a jar for our family and hopefully we can work together to fill it up with “bunny tails” through this Easter season and keep the message of Christ close to our hearts. Such a great idea from the Happy Home Fairy! Check-out the site for a full tutorial. I modified the original poem slightly to meet my needs. Here is what I did for our Bunny Service Jar. First, I cut out an ear shape from burlap scraps and then used the first ear as a template for the second. I made them with quite a wide base. I then added a bit of podge around the edges to prevent them from fraying. I made the ears extra wide so that I could slide a needle and twine through the bottom to gather them. I then glued on the ears using my hot glue gun. 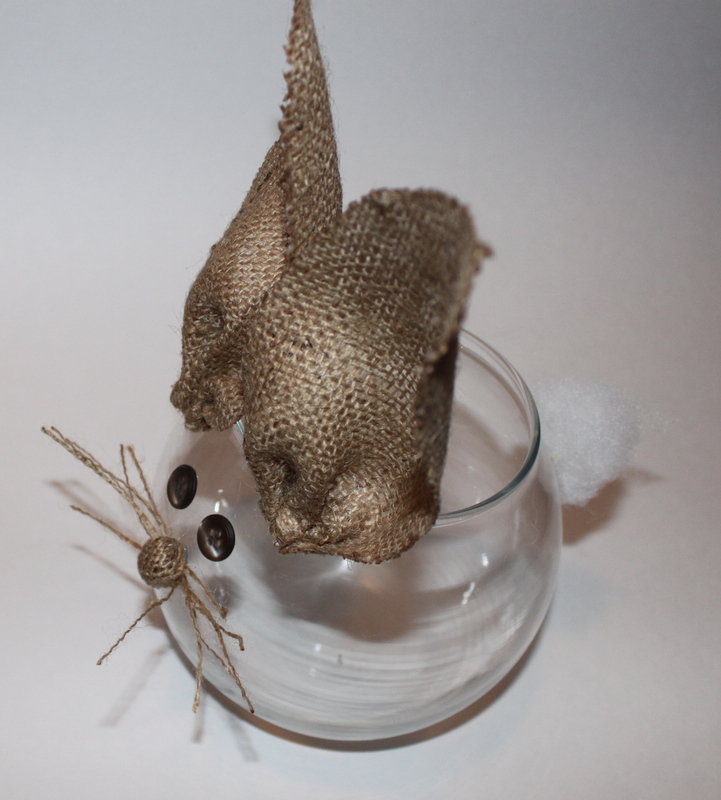 I liked the burlap look and decided to cover a glass bead in burlap for the nose. I pulled several strands from the burlap and used them for whiskers. I then glued the whiskers and nose on. I added two button eyes and a cotton tail. I typed out the poem with a few modifications and added a few embellishments before attaching it to the jar. I have a supply of cotton balls that can be added to the jar as acts of service are performed! I added a bit of Modge Podge to the edges to prevent fraying. I gathered the bottoms of the ears using a needle and twine. Here is the finished poem with a few minor embellishments. 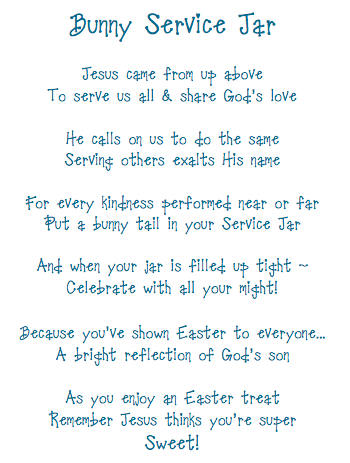 Posted on April 16, 2014 by Cindy Roy •	This entry was posted in Health and Wellness and tagged bunny service jars, Easter ideas, keeping Jesus in Easter, spirit of Easter, teaching your kids about Easter. Bookmark the permalink.